A CT scan uses x-ray technology to take views of the inside of the body. It can take clearer and more detailed pictures than regular x-rays. 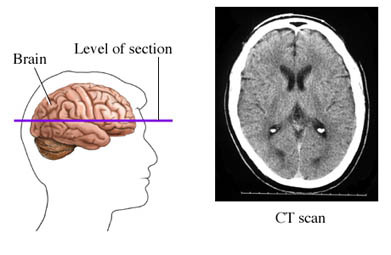 You are exposed to some radiation during a CT scan. It can raise your lifetime risk of cancer. This risk raises the more times you are exposed. Pregnant woman and children are at higher risk. CT scans are usually not advised for pregnant women. Talk to your doctor about these risks before the test. Before your test, follow your doctor’s advice about any changes to your medicines or food. Staff will tell you about the test and answer any questions you may have. You will remove your clothes and put on a gown or robe. You will remove all jewelry, hair clips, dentures, and other objects. These items can make the images hard to read. If your CT scan uses oral contrast material, you will need to drink it at this time. You will lie (usually on your back) on a mobile bed. The bed will slide into the donut-shaped CT scanner. An IV line may be placed in your hand or arm. Salt water and contrast material may be injected into the IV during the test. The technologist will leave the room. Staff will talk to you using an intercom. The machine will take a series of pictures of the part of your body that is being studied. Your bed may move slightly between pictures. You will need to wait for the technician to review your images. More images may need to be taken. About 10-15 minutes. It will take longer if more pictures need to be taken. You may feel warm and flushed if contrast material is injected into your vein. The CT images will be sent to a radiologist who will study them. Your doctor will get the results and talk about them with you. Computed tomography (CT)—body. Radiology Info—Radiological Society of North America website. Available at: http://www.radiologyinfo.org/en/info.cfm?pg=bodyct&bhcp=1. Updated March 16, 2016. Accessed March 13, 2018. Radiation-emitting products: computed tomography (CT). US Food & Drug Administration website. Available at: https://www.fda.gov/Radiation-EmittingProducts/RadiationEmittingProductsandProcedures/MedicalImaging/MedicalX-Rays/ucm115317.htm. Updated March 7, 2018. Accessed March 13, 2018.